I think that most of you already know Las Vegas hard rockers Adelitas Way, so I'll keep it short: I doubt that you will find a better hard rock/active rock album this year than their new one, Getaway. Sure they haven't an original sound, but who cares when you have all these anthemic rock hits collected in one record? Getaway was crowd funded by fans on the band's pledge music campaign. It was recorded in Chicago at Groove master studios with award-winning producer Johnny K (3 Doors Down, Saint Asonia, Finger Eleven, Plain White T's) and released last week on The Fuel Music. Getaway features all the five tracks from last year's Deserve This EP, plus 6 new great songs, including the new single Bad Reputation. Stream the whole album clicking on the image. Saint Asonia is a Canadian-American alternative rock supergroup, featuring ex-Three Days Grace singer and guitarist Adam Gontier, Staind guitarist Mike Mushok, Eye Empire bassplayer Corey Lowery and former Finger Eleven drummer Rich Beddoe. The band released their self-titled debut album yesterday July 31 on RCA Records. The record was produced by renowned knobs-wiz Johnny K (3 Doors Down, Staind, Finger Eleven) and features the singles Better Place, Blow Me Wide Open and Let Me Live My Life. Watch the brand new video for Better Place now clicking on the image above. Aranda is a hard-hitting rock act from Oklahoma City featuring brothers Gabe and Dameon Aranda. They have a brand new album out now named Not The Same. It's a brilliant alternative album that winks at mainstream rock. It was released last Tuesday on Wind-up Records and was produced by Grammy Award nominated producer Johnny K (3 Doors Down, Staind, Finger Eleven). Watch the lyric video for the first single off the new record Don't Wake Me clicking on the image and stream the whole LP on Spotify now. Here's the video for "Pain Killer", the new single from Pennsylvania-based alternative rockers The Letter Black. "Pain Killer" is featured on the band's upcoming sophomore full-length album "Rebuild", to be released next week on Tooth & Nail Records. "Rebuild" was produced by Jasen Rauch (Red, Breaking Benjamin, Pillar) and Johnny K (Megadeth, 3 Doors Down, Finger Eleven) and mixed by David Bendeth (Paramore, Papa Roach, Breaking Benjamin) and Jay Ruston (Meat Loaf, Bowling For Soup, Jars Of Clay). The band has teamed up with Revolver Magazine to premiere the whole album. Check it out now following this link. Valora is a rock band from Whittier, CA, led by beautiful 22-year old singer Syd Duran (see picture on the left). Playing with Syd we find her sister Taelor on keyboards and background vocals, and 4 males on lead, rhythm, bass guitar and drums. Signed to Hollywood Records by Buena Vista Music Group Chairman Bob Cavallo, Valora have released a couple of tracks on high-profile soundtracks as "The Last Song" and "Almost Alice"; Syd also added her vocals to Breaking Benjamin's hit song "Blow Me Away". Valora's debut album, "I Waited For You" was produced and recorded by Johnny K and mixed by another big name, Neil Avron. It will be released next April 3rd, but you can already watch the video for the titletrack and first single off the album, following this link. For further info and to download the band's song "No Matter What" for free, head on Valora's website now. 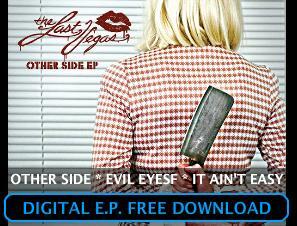 If you like your rock hard, glamorous, punkish 'n' sleazy, then you should try Chicago based band The Last Vegas. Their last album "Whatever Gets You Off" (2009) was produced by Nikki Sixx, Sixx:A.M. guitarist DJ Ashba, as well as Marti Frederiksen. The american outfit is going to release their new full-length "Other Side" in early 2012, this time with Johnny K (Staind, 3 Doors Down, Finger Eleven, Plain White T's, Machine Head) at the production helm. Meanwhile, you can download for free the 3-tracks "Other Side EP" (click on the image to be redirected to the download page) and watch the video for the title-track of the album/ep, starring cult actress Sybil Danning (Howling II, Halloween - The Beginning, Werewolf Women of the SS) here.